Colombia and Ecuador vowed offensives against a dissident FARC guerrilla group, after the kidnapping and killing of two journalists and their driver. Ecuador’s President Lenin Moreno and his Colombian counterpart Juan Manuel Santos told press they had spoken about measures against the group that is active in the two countries’ border region. The Ecuadorean president announced a $200,000 reward for information leading to the arrest of “Guacho,” the guerrilla leader held responsible for the killings. 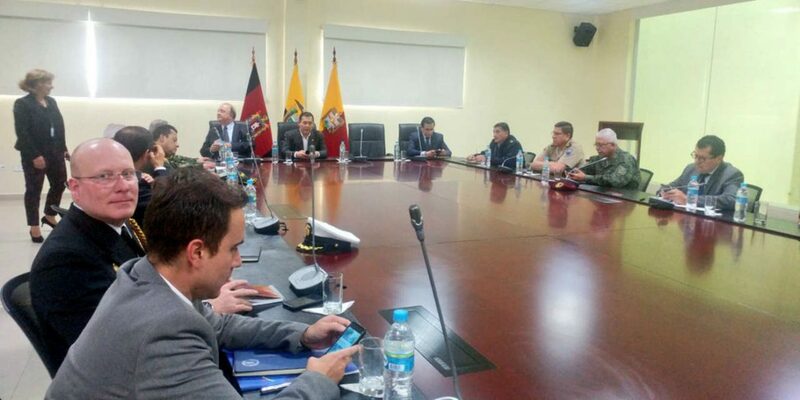 Santos said on Twitter that he dispatched his defense minister and armed forces commander to the Ecuadorean capital of Quito in efforts to coordinate military action with the neighboring country. “I reiterated that he has and will have my full support, that of our Armed Forces and the Colombian people,” Santos said on Twitter. The minister said he would add $30,000 to the reward offered for Guacho. Colombia sent 2,000 soldiers to Tumaco, the area the group of an estimated 500 fighters operate, in January. Tumaco is one of the country’s most important ports for the export of cocaine and is located only miles from the Ecuadorean border. Local gangs, regional drug traffickers and armed groups vie for control of area since the demobilization of the FARC. Guerrillas who abandoned a peace process with the FARC, the group that demobilized 14,000 people last year, formed the Oliver Sinisterra Front and have since taken control over much of the cross-border drug trafficking activities in the region.